Like a person that has fallen in love, the more time I spend in India, the more I see India for its beauty and not its flaws – and there is so much beauty. 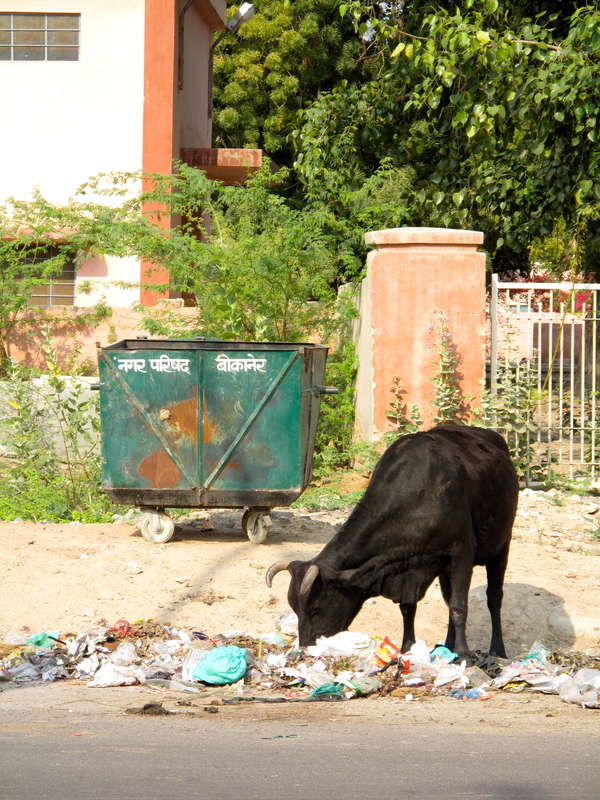 But there are sights that jar me back to harsh reality and one of those is seeing a cow eat trash. This happened nearly every morning I left my house in Mysore to walk to the medical clinic where I volunteered – Jag Therapy. Just a stone’s throw away from my house was a ditch filled with a sprawling pile of trash on an empty lot. Here I would often see a cow, and sometimes its cohorts, the cattle egret and crow, perusing the neighborhood effluvia. It was frustrating to witness, not merely because of the welfare problems present when cattle eat trash, including plastic bags, but more so because there was a neighborhood dumpster located a block away. In this new middle class suburb in Mysore, people don’t make the effort to walk to the dumpster. They leave trash in ditches throughout the neighborhood. 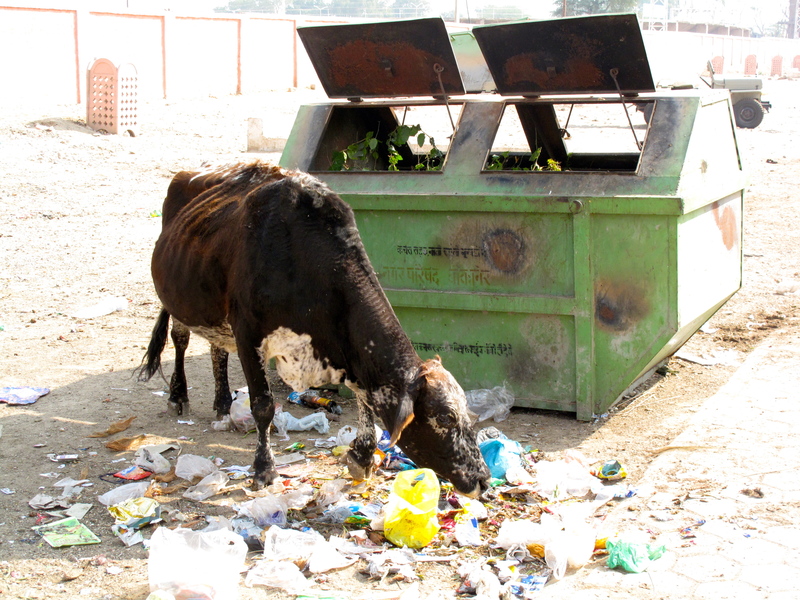 Depending on the way you define trash, you could say that cattle have a long history eating trash in India. Cows have always been fed kitchen scraps, often presented as a religious offering in the mornings. When I visited Varanasi, a city that may have the densest population of cattle in India, one of my guides’ wives, Mrs. Gupta told me that the first chapatti (flat bread) of the day is offered to the cows as a blessing of prosperity, and the last goes to the dogs to appease the ghost world which dogs are associated with. But these offerings are often made in vegetable and fruit scraps, the ubiquitous bi products of traditional Hindu vegetarian cooking. In Varanasi, a city full of devout Hindus, the loose cattle make their rounds, routinely collecting their offerings. Mrs. Gupta said that every morning a cow came into her courtyard and mooed, a signal that she should come down and deposit her kitchen scraps at the cow’s feet. In an ideal world, this is a beautiful system. No food goes to waste and what would be garbage is turned into valuable manure to be used for cooking fuel, fertilizer, and in some cases building material, household cleaner, or medicine. 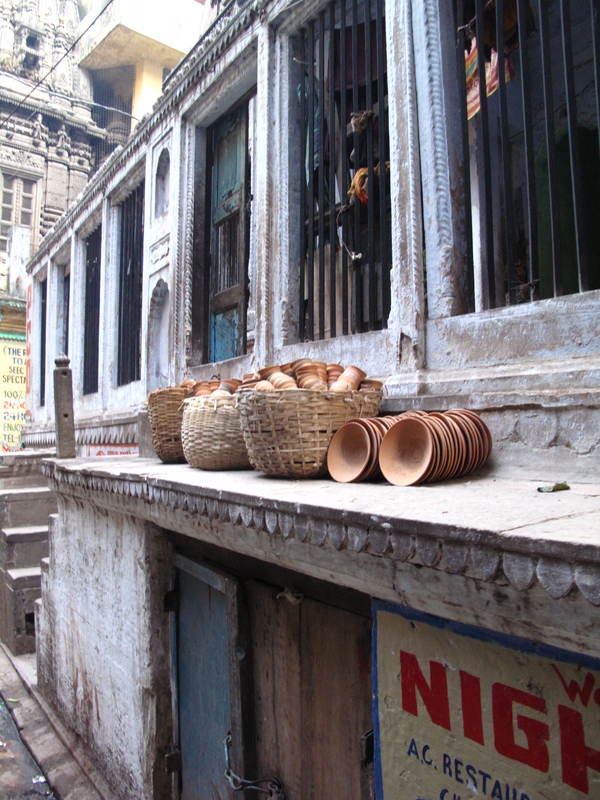 These clay cups are still used for tea and sweets on the streets in Varanasi and elsewhere in India. When finished you throw the cup on the ground, the ragpickers clean up the clay shards sometimes recycling them into new clay cups. Clay products have been used for centuries and are still cow friendly. But we live in a far from ideal world. The introduction of plastic to India, in particular, plastic bags, has transformed India’s landscape from one in which a scrap heap became a benign compost pile, into a one where your gaze always can spot a plastic bag or chewing tobacco wrapper no matter where you are in the city or the countryside. This is far from a mere aesthetic offence. 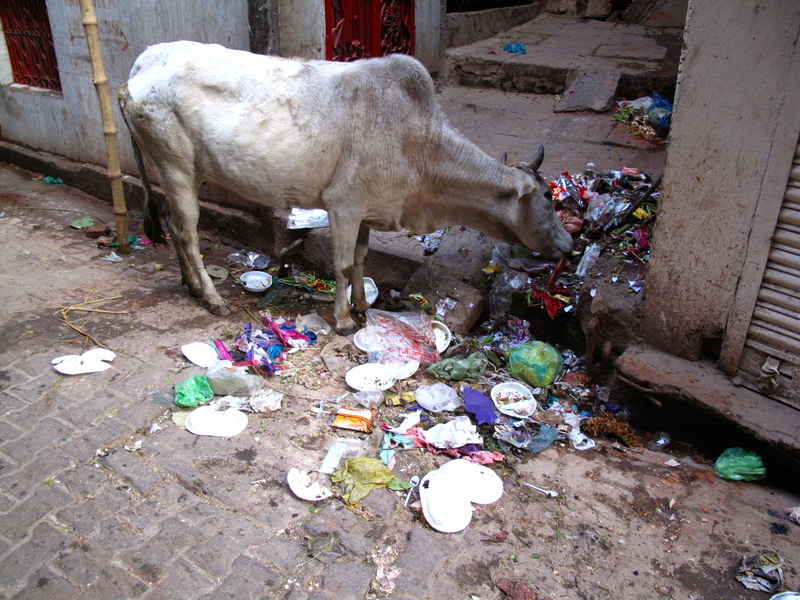 Plastic is being consumed by feral cattle which forage for food in trash heaps. 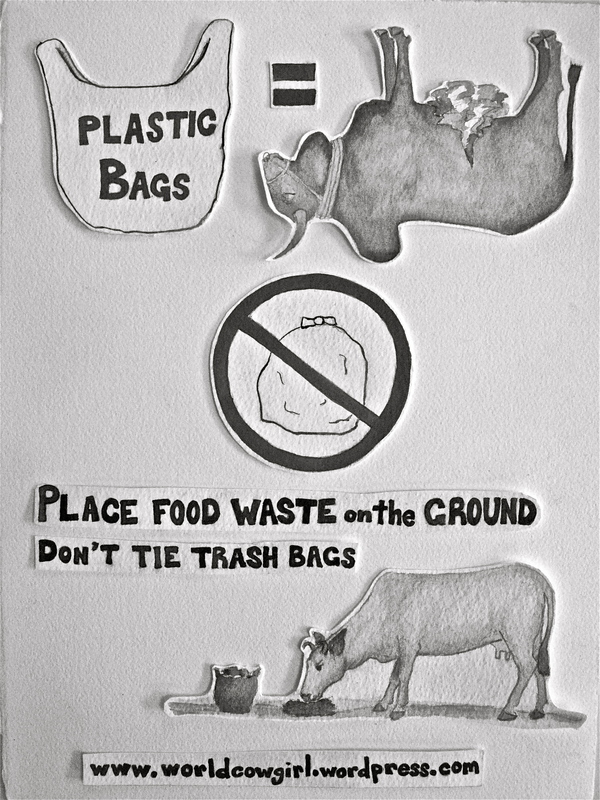 When people conceal their food waste within plastic trash bags cattle consume the plastic along with the food. 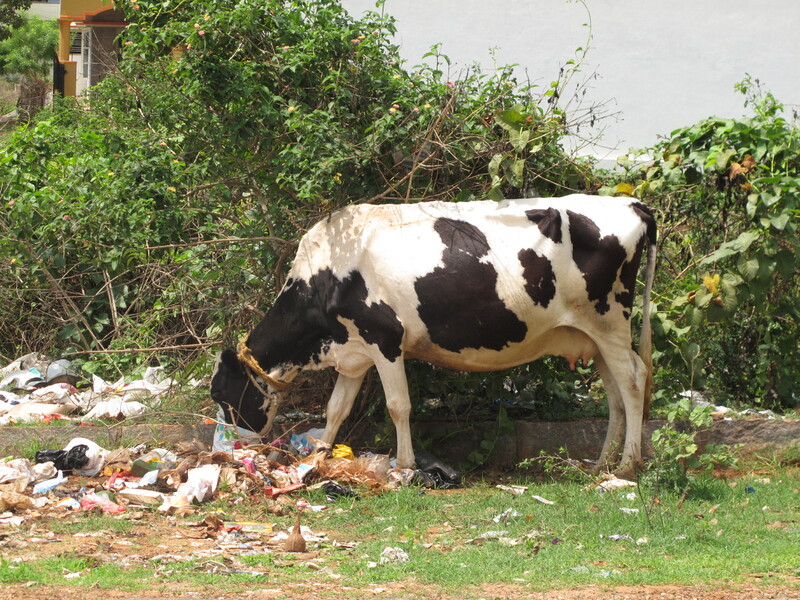 If a cow eats enough plastic bags their digestion suffers when the bags collect in their rumen (the cow’s stomachs) or the intestines causing the cattle to die of impaction or starvation – both painful ways to die. The Karuna Society, an animal welfare society in Andhra Pradesh, removed 40 kgs (88 pounds!) of plastic from a cow they autopsied. Just think of the thousands of tons of plastic that are being carried in the bellies of cattle all over India. This is a poor life for the cattle that have bestowed so many blessings on humanity – especially in India. And a striking symbol for the dark side of an increasingly modern India. Plastic not only affects the wellbeing of cattle, but also the people who consume milk from cattle who are allowed to roam free during the day and return to their owners in the evenings, or feral cattle, especially males that end up as meat whether legally, in the two states that allow slaughter and sale of beef, or in the illegal meat trade. Polymers in plastic are a carcinogen (a cancer causing agent) when consumed in animals or humans and ingesting milk or meat from cattle that have ingested plastic, sometimes in astounding quantities, is extremely harmful for human health. The blog “Clear Impression” sited two scientific studies done on the level of toxins that people living near dumps in Southeast Asia are exposed to. One study connected drinking cows milk from cows feeding at the dump with exposure to dioxins, some of the most toxic chemicals known to science. One of the studies reported: “Our results suggest that residents living near the dumping site in India have been exposed to relatively high levels of these contaminants, possibly through intake of bovine milk . . . It is anticipated that pollution from dioxin related compounds may further increase and that residue levels in human breast milk may increase in the future because even now the sources of these contaminants are not regulated at all.” Another study that sampled breast milk from mothers living around dump sites in Chennai and Kolkata found dioxins at levels hundreds of times higher than the limit set by the World Health Organization. Whether or not you are a vegetarian, this is a compelling argument to be careful about consuming cattle products in India. As Dr. Kadaba Jagadish, the doctor I worked for at Jag Therapy in Mysore, advises to know the cows that produce the milk you use and what they eat. His own cattle eat rice hay, kitchen scraps, and are watched by the man who tends them when they are let out to graze in the neighborhood. This problem is widely recognized, but the solutions do not appear to be easily forthcoming. Some states, like Uttar Pradesh, where Varanasi is located, have banned some plastic bags, only allowing plastic bags of a certain thickness (measured in microns). These thicker plastic bags are harder for cattle to eat and more valuable to ragpickers – a caste of people in India who collect garbage for reuse or recycling. Yet the law is either ignored or difficult to enforce. Officials either don’t measure the bags or accept bribes to allow vendors to continue using the illegal bags. Bribing officials is a ubiquitous practice throughout India and makes changing some public policies next to impossible. Also, I have not seen any scientific studies done to measure whether or not cattle do not eat these thicker plastic bags and if this law would indeed benefit the welfare of street cattle. So it remains up to individuals and non-profits to minimize their use of plastic or prevent cattle from eating it. Non-profits all over India try to aid cattle. This Gaushala (cow sanctuary) in the center of Karnal, Haryana, keeps 2000 cows off the streets and houses them in large covered barns and open paddocks. This was the best I could do with my limited artistic and technological abilities. I encourage you to print a copy of this poster and hang it up in a public place. I challenge you to make your own poster and put it up wherever you think the most people will see it. Since I only know a few words in Hindi or Kanada and am completely illiterate in all the other numerous languages spoken in India, I request that you write a poster in your native language. If you make a poster send me a copy of it and I will post it on my blog. When I am in India, I will hang these posters in public places. The government is unwilling or unable to protect India’s large cow population (and our public health), but in our own small way you and I can make a difference for Gaumata (the divine mother cow). Minimize your use of plastic, keep food waste separate from plastic bags, and educate others to do the same. We will all benefit from it. 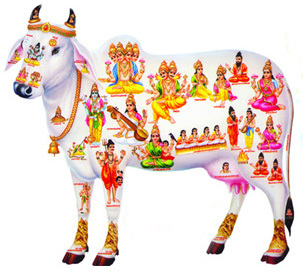 Gaumata – Every part of the cow represents a divinity. This entry was posted in India and tagged Animal Welfare, Karuna Society, Pollution, Trash. Bookmark the permalink. The poster is perfect: simple and doesn’t really require too many words, so I don’t think even the translation will be too difficult for anyone to attempt. Nice work Kels… I love it. Cow is a Universal Mother since the Lord Krishna had domesticated and for welfare of Mankind, So in present eras indigenous breed r neglected in famine,dry ,low rain areas and India have still Famine and rainfed condition , Panjarapole invillages, and with religious concept survived, but it need very drastic action for slaughter and animal crualty act inforce ,with city ares community aress like Cow hostel is being opened by Govt of Gujarat ,and Gausadan in Saurastra area of Gujarat. But in Organic agriculture nutrious ,non chemical oriented foods ,bullock for Agri -operation we must sustain these breed..Unproductive animals from breeders r sent in societies are of cities , temple ,and panjarapole (Run by JainReligon) will be survived and again when it come in dparturation time owner will take to his home. Any how trash exmple My suggestion is to preserve breeds in any condition otherwise it will be abolish origine Zebu cattle in coming decade. Cows eating plastic is heartbreaking and I have always felt deeply about this subject. They eating kitchen scraps is not necessarily a bad thing, I think – but today’s plastic culture is just horrible. Here I cannot help bringing up a religious topic too. While some religious groups try to help cattle, many don’t. For example, I know one place where cows “happily” eat plastic along with other garbage, and just a stone throw away there is a “Krishna Janmashtami” related building. Every year in that street lakhs of rupees are spent on celebrations; and throughout year I have seen people lazily sitting in front of that building, but they don’t care about cows. I feel that it is ridiculous that they call themselves as lord Krishna’s devotees. They can easily join hands with city administration and spend money on better waste management, at least something right in front of their eyes! I am intending to capture few good pictures of that spot, write a letter to that Krishna organization with a request to take some action in the best interest of cows. I am out of that city now, and it will take some time before I can do it. In Ahmedabad also I see this trend in many places. However, one thought here – in earlier days kitchen waste was either fed to cows OR was going back to soil in the backyard, but these days flat/apartment culture is leaving people with no land/soil of their own. That, according to me, is becoming a big root cause. 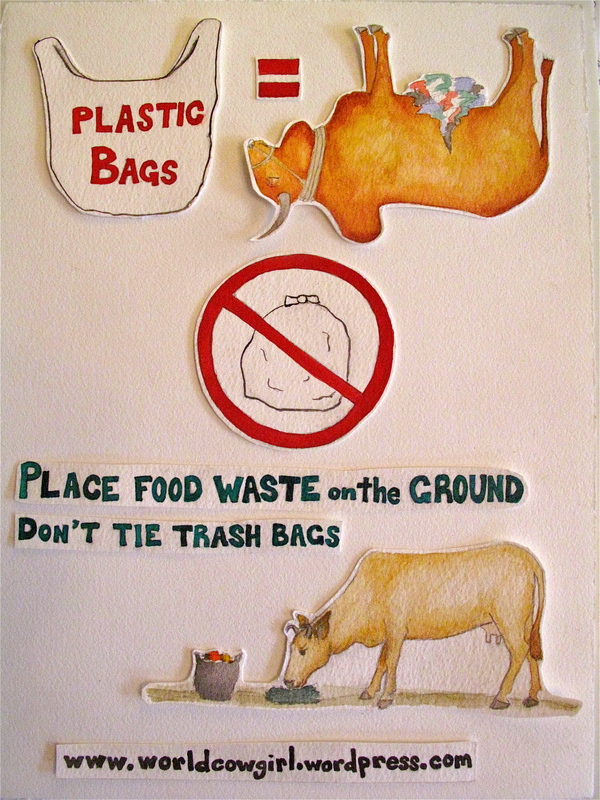 Also, biodegradable bags are coming to picture – and many people have started using it guilt free as it is “green bag”. What is the affect of those on cattle? I am sure no research has happened on that either. Your posters are cool, its a great job that you are doing. Keep it up. I will stop for now, once again I apprecaite your concern towards cows in India. Thanks for these articles. Hey, one more thing – if you want some awareness materials to be translated to Kannada, feel free to contact me. I am a Kannadiga and can help you. Krishna, I appreciate your comments and hearing your perspective on this issue. I agree that people’s modern lifestyles and their lack of connection with the soil and animals is causing great harms, especially to cattle. It is fascinating to learn about the “green bags” and that they may be equally harmful to cattle. Please share any more observations about this problem with me in the future. It would be wonderful to have my writing about cows translated into Kannada. You are welcome to re-post translations on your blog and link to my English version. Maybe the next time I am in India I can have pamphlets printed? Keep in touch and best wishes for your work. I didn’t know about this video. Thanks for sharing! I wonder what’s worse, cows eating plastic, or cows eating what they are routinely fed in America. In a recent interview, the lead scientist from Consumer Reports mentioned that calves in the US are fed spray-dried bovine plasma as a substitute for cow milk. The plasma is a waste product from slaughterhouses. A common ingredient of cow feed is chicken waste, which is approximately 30% spilled chickenfeed and 70% chickenshit. The chickenfeed is made from cow slaughterhouse waste. In America, we’ve turned cows into cannibals. Both these practices–feeding calves spray-dried bovine plasma and feeding cows waste from confined poultry feeding operations–are illegal in Europe and Japan. I wholeheartedly agree that there are significant welfare issues facing cattle in the United States. That is the reason that I am working on a book about cow welfare around the world – which is also about public and environmental health around the world. I am also active in the local food movement in Colorado, helping people find food producers that treat their livestock with dignity and care about the health of food consumers and the environment. You’ll see more info on welfare issues with cattle in the U.S. on my blog in the future. | World Cow Girl” ended up being a very good posting. Thank you for an excellent article. It has inspired me. Did anyone translate it into hindi? If so, could you e mail it to me to share with others? How do cow hostels like the one in haryana work and how practical to implement them? 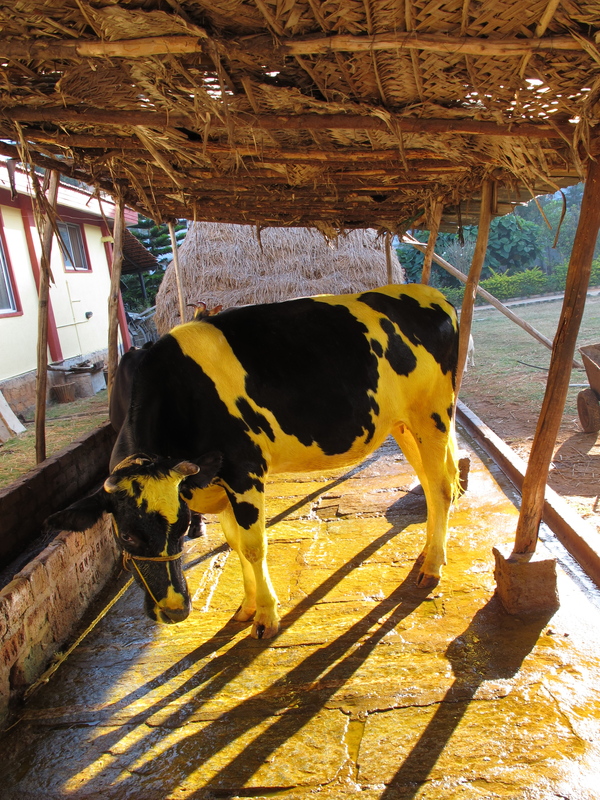 I am using cow urine medicine produced at an ashram’s university in haridwar where I am at presently. 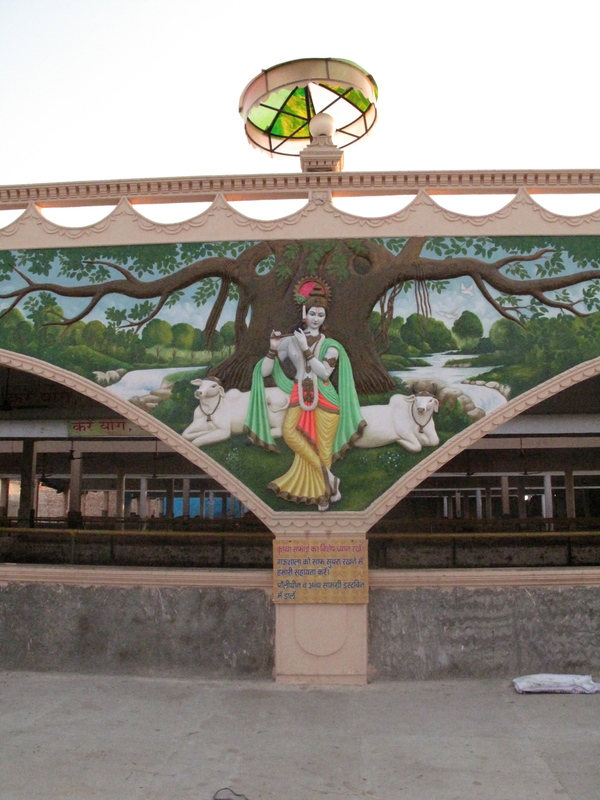 Thousands of villagers come from all over India year around to this ashram. I will share this with those in charge to educate their devotees on the harm to health of the practice. Thanks, Philip. I’ll be in touch via email soon. Hello! I’m an American currently here in Mysore (at the V-LEAD/Swami Vivekananda Youth Movement school) for three weeks for a class centered on Indian healthcare, public health, medicine, etc (among many other peripheral topics!). 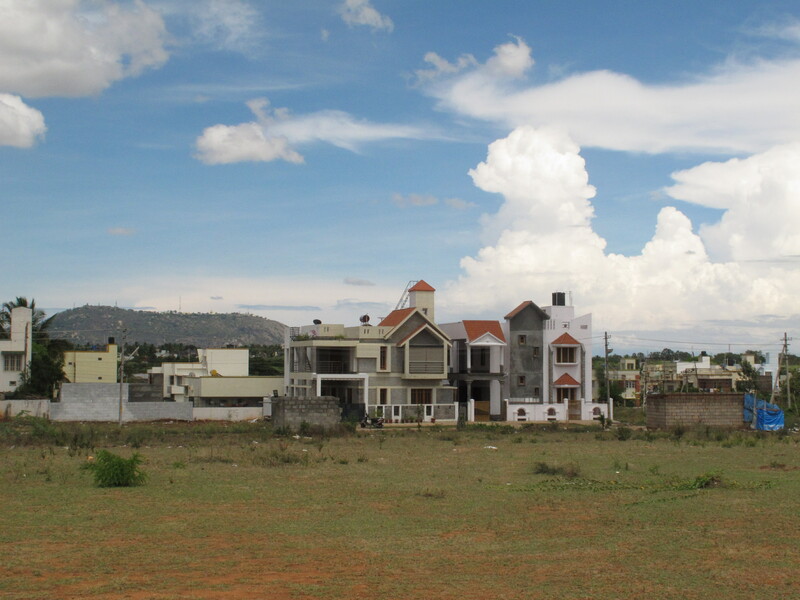 One of our assignments is a team project, and my team is considering a project to investigate the role/impact of free-ranging animals (cows and dogs specifically) on public health in India generally, but specifically in Mysore since this in the location in which we’re studying. I came across your post in my initial web searching on docs/publications/posts addressing this issue and yours was near the top. We will decide tonight what our project focus will be (we’re considering two other topics as well), but if we go with the cows/dogs/animals/public-health project, I’m curious whether you’re still here in Mysore and if you would be available/amenable to sharing your knowledge/experiences with us? Thank you in advance if you’re able to respond, and my thanks you to at the very least for your informative post! If you are visiting Bangalore anytime, please do visit first and only 100% vegan restaurant here i.e. Carrots, The Healthy Kitchen. Anyways, do checkout http://karunasociety.org/ – they do lot of work on cattle welfare area, they have come up with a nice documentary called ‘Plastic Cow’ that focuses on waste management and impact on cows. I understand that what you are looking for is the other way round i.e. impact of animals on human beings, but still some of these people might be able to help you out. Hey kelsi nagy, your article is so good and informative, actually I am also fed up with all this process of plastic bags by cows and I was finding the effects of plastic bags consume by cow for my article and your article proves so helpful for me thank you for sharing this important article with us. Can we use the images for preparation of awareness hoardings dissuading plastic usage in India? Yes, please share any images. Best wishes for your work discouraging plastic use and pollution.